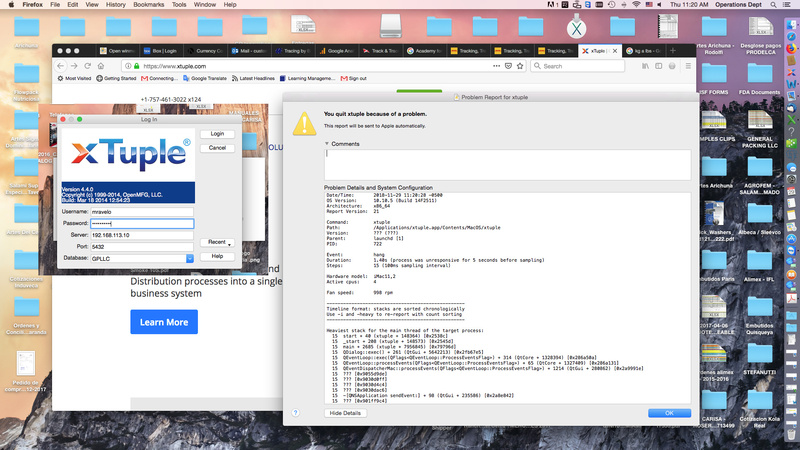 I installed the Xtuple 4.0.5 software for a client on a mac OS today and successfully logged in to the quickstart database and started entering items and customers. I had to walk away to take care of something else, and about an hour later when i returned to keep working the software was frozen. I forced a restart and the software won't let me log in with the correct credentials -- it gives me an error message that the client URL ([cloud ID].xtuple.com) cannot be found. i tried logging in with the same credentials to the demo database and that doesn't work, either. I checked the forums and I couldn't find anyone who sounded like they had this exact problem. Any help would be very much appreciated. The URL for your free trial is [cloud ID].xtuplecloud.com. Please give that a try. I have a similar problem, Im trying to login but it keep loading and then after long time its said there was an error, and I have already restart my computer, quit application and everything, can you please help me.